Members of the Prince of Wales Social Aid & Pleasure Club during their 2010 parade. Photo © Matt Sakakeeny. Listen to a radio story about Prince of Wales from American Routes in 2009. 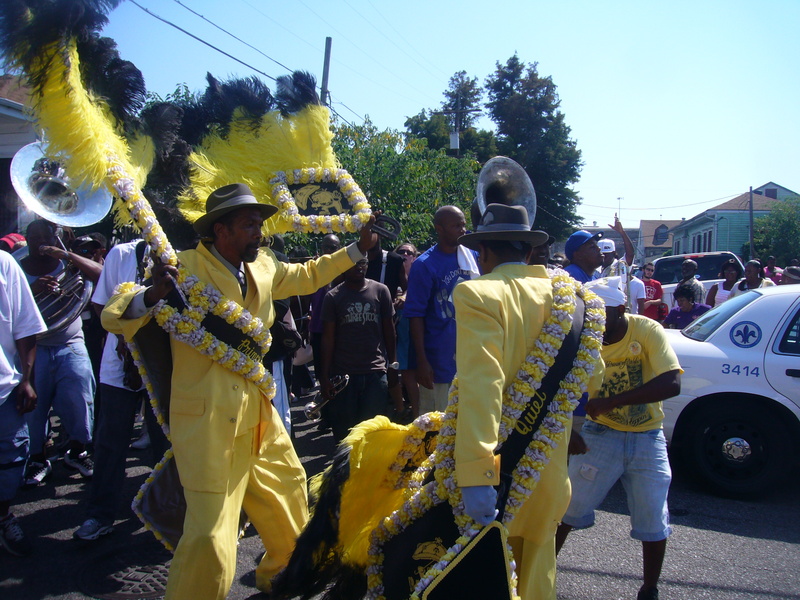 The Prince of Wales Social Aid and Pleasure Club claims to be the second oldest parading club in New Orleans. Prince of Wales is based in the Irish Channel area of Uptown New Orleans (also known as the 12th ward). The club was established in 1928 by dock and rail yard workers from the wharves and rail lines along Tchoupitoulas Street. There are two theories as to the origin of the club’s name. One suggests that the club members all drank J&B scotch, whose bottles pay tribute to the Prince of Wales. The other points to a visit to New Orleans by the Prince of Wales in the late 1920s, whose dress and sophisticated image inspired the club’s founders. The club typically parades during the second weekend of October, beginning and ending at the Rock Bottom Lounge on Tchoupitoulas Street. The current club is notable for the inclusion of two white members, the union organizer Joe Stern and the Tulane professor Joel Dinerstein. Read more about the Prince of Wales in this Oral History Project sponsored by Tulane University and American Routes.